The revolutionary HotHouse will fit snuggly up to any standard size door of your house, shed or garage. This unique design features 2 doors. 1 door aligns with the existing external door of your home, the other provides outside access. The roof of the HotHouse is slanted to ensure that precipitation runs away from your house. Perfect for placement close toy our kitchen for convenient access to your fresh HotHouse grown fruits, vegetables and spices. 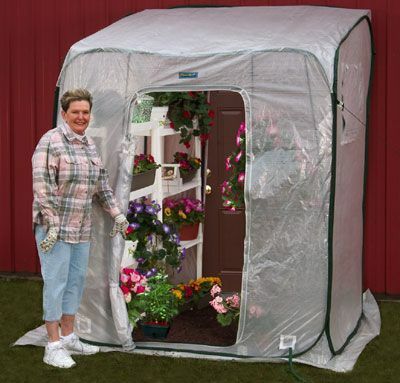 Compact and lightweight, the HotHouse requires no tools to set-up, or takedown and stores in minutes! In addition to the doors, two screen vented windows provide optimum ventilation and pest protection.